Update: Chef Le Squer has left and the kitchen has been taken over by Chef Yannick Alleno who has (thankfully) completed his sabbatical after leaving Le Meurice recently. 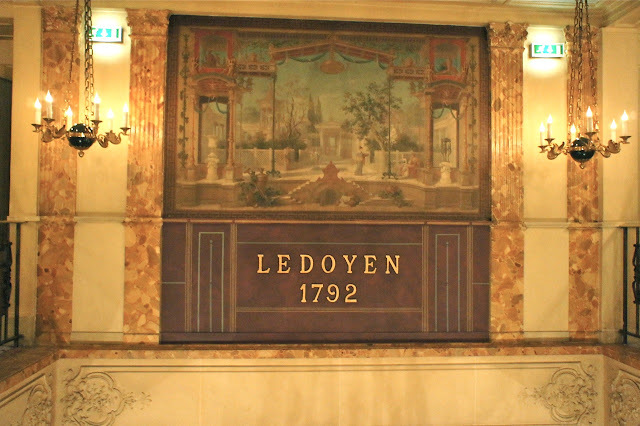 Ledoyen is a 3-Michelin star restaurant in Paris, set in an 18th century neo-classical bungalow on grounds along Champs-Elysees and just next to the Place de la Concorde. This is apparently Paris' oldest restaurant and was opened for the first time in 1792. With this backdrop, we were set for what would turn out to be, food-wise, probably our best meal during this Paris trip, edging out Le Meurice very slightly. 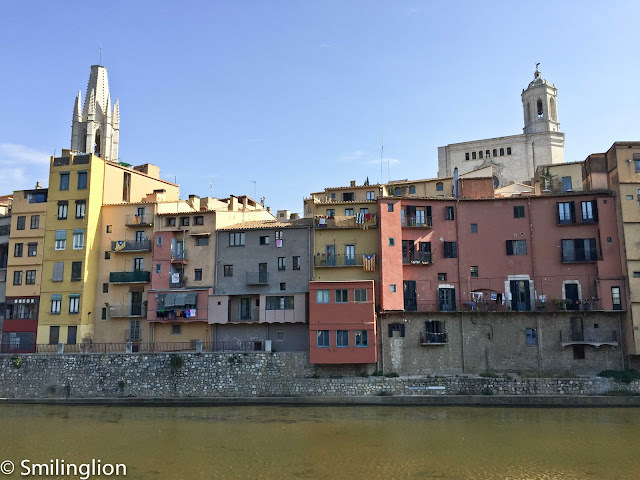 We initially did not intend to come to this restaurant, as our original reservation was with L'Arpege, which as it turned out, had a kitchen fire the week before and was closed for the month. All these we found out on the day itself, which led to a mad scramble to get another restaurant in the morning. Fortunately, the concierge at the Le Meurice was very helpful and he suggested that we try to get a table at Pierre Gagnaire, Ledoyen or Lasserre (in that order). Pierre Gagnaire was booked out but he managed (through his extensive network - he was a life saver) to get us a table at Ledoyen, which turned out to be a blessing in disguise. What more, Ledoyen is 5-10 minutes leisurely walk from our hotel, which made it very easy to get to. Upon entry to the restaurant, we were led past the ground floor reception area to the second floor dining room, which was very ornate, and seated at the end of the hall next to the window. This was a prime seat, as we had the view of the gardens and the Champs Elysees as well. Each table had a fresh flower setting and silver candlesticks and they lit all 5 candles for each table for the evening. We were served with champagne and picked out a reasonably (relatively speaking) priced 2001 Gevrey-Chambertin En Champs from Daniel Mortet, which was drinking very nicely. 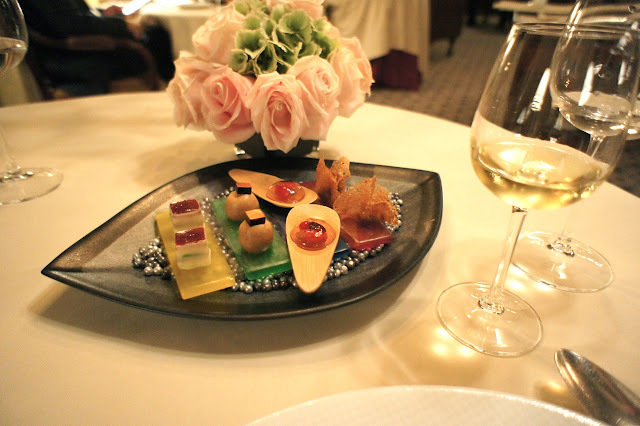 Similarly with our experience at Le Meurice, with such a grand and opulent setting, we expected traditional french cuisine but was instead pleasantly surprised by the modernity of the Chef Christian Le Squer's cooking. Amuse bouche was a selection of bites, the most interesting of which was a very interesting 'ginger water'; this was literally a bubble made of ginger water (you pop the whole thing in your mouth and burst it, it's all air inside, but the membrane tasted like ginger). 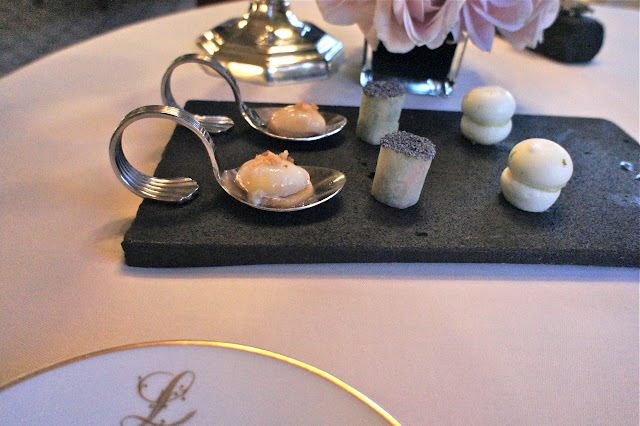 We expected to be served the first course by this time, but the amuse bouche kept on coming. 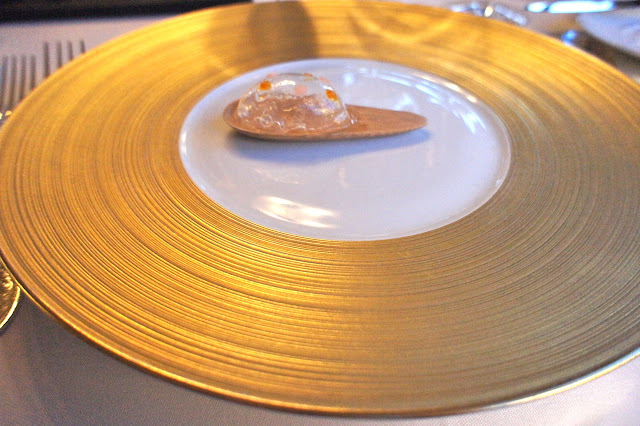 This time it was a whelk dish which was way more substantial than your usual amuse bouche, but it was excellent. 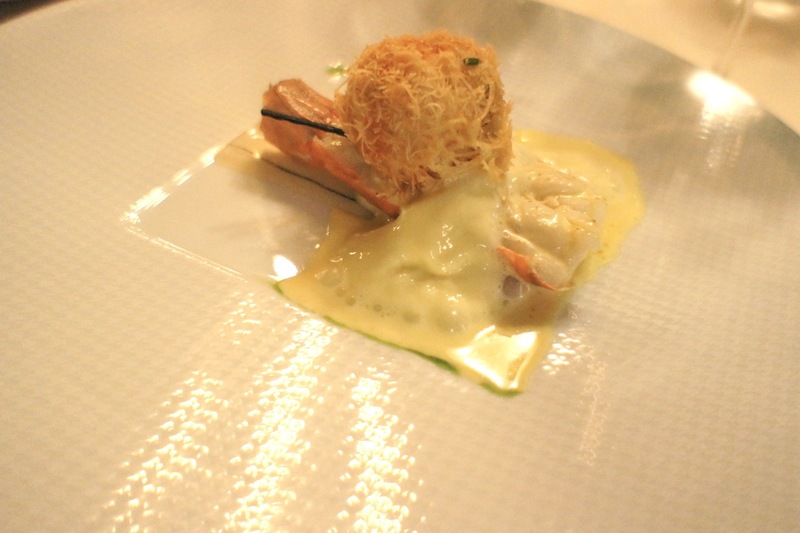 First course was the langoustine cooked in 2 ways: poached in butter and breaded. The sauce was superb and though the breaded langoustine tasted like what you could find in a Cantonese restaurant dim sum menu, was very well done nonetheless. 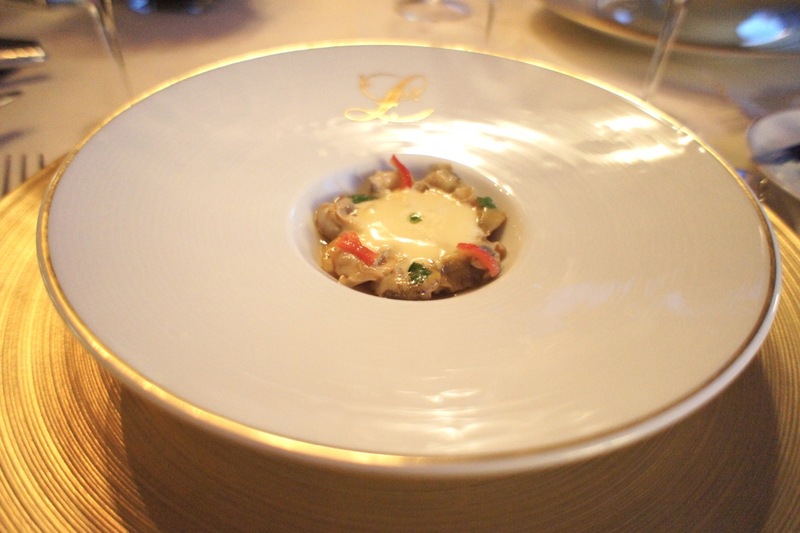 Next was one of the chef's signature dishes , the superb blanc de turbot de ligne jus braise, pommes rattes trufflees. 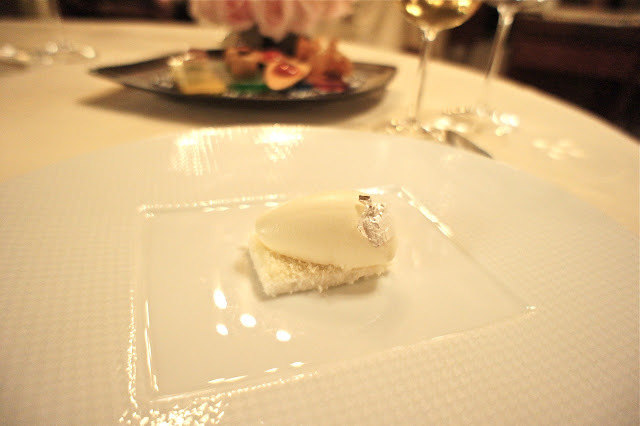 Not almost as good as the Turbot at Le Meurice, but right up there amongst the best in any case. 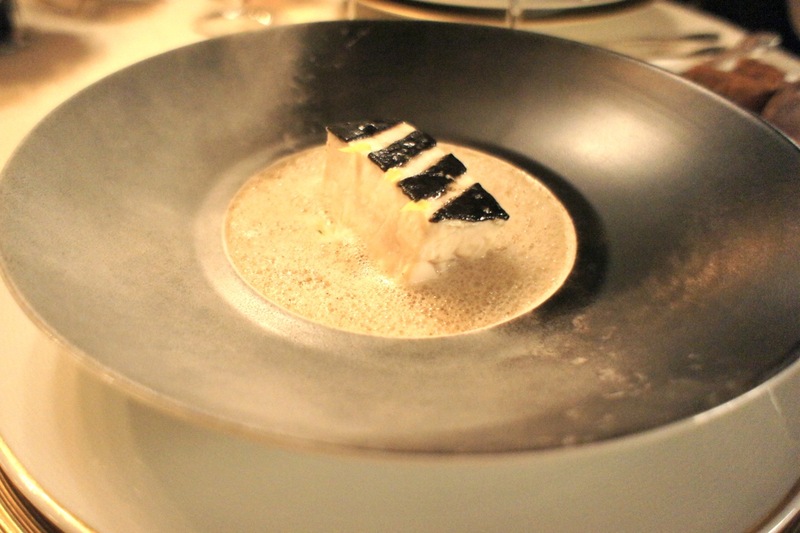 The truffle foamy sauce was rich and complemented the fresh and juicy flesh of the fish. We loved the large chunk of boneless fish (which had the texture similar to cod but tastes more like sea bass) with strips of truffles on top and cooked to perfection. 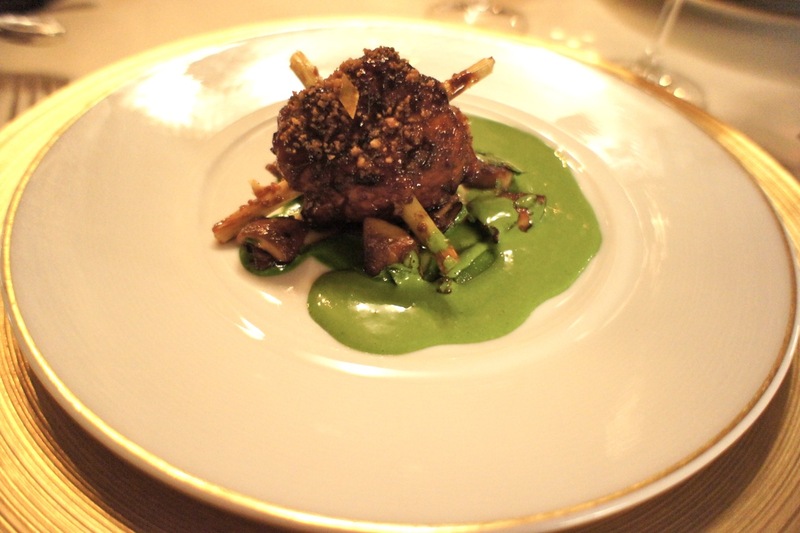 The other signature dish of Chef Christian was the ris de veau en brochette de bois de citronelle, jus d'herbes, which was essentially calf sweetbread skewered with lemongrass with herb sauce. We were pre-warned about how heavy this dish could be (we didn't know what sweetbread was till recently - in fact it's innards like pancreas, heart, stomach or belly), but surprisingly, this was very soft, tasty and delicious. We felt that the lemongrass made a big difference as it added an interesting flavour to the otherwise full and overpowering taste of the meat, although it was a bit strange to find Thai culinary influences here in this restaurant. The thick herb sauce also did its part to balance off the rich flavours of the sweetbread. We had a very interesting table next to us; there was a rather boisterous American couple who were on their honeymoon. The gentleman was in his fifties and clearly knew a bit about how to enjoy life, and his new wife could not have been more than thirty. They were quite impressive drinkers, glass of champagne each, followed by a bottle of white burgundy and a bottle of red bordeaux. Halfway through the dinner they turned to us (seeing as how we started dinner earlier) and asked us if dinner was ever going to end (they were struggling to finish their food; the amount of wines they had must have had something to do with it). The sarcastic french waiter was very patronising towards them the whole night, as they would talk like they dined like this a lot but somehow were still unfamiliar with what French wines they liked or what cheeses they wanted. The same waiter was not any nicer to us initially either. 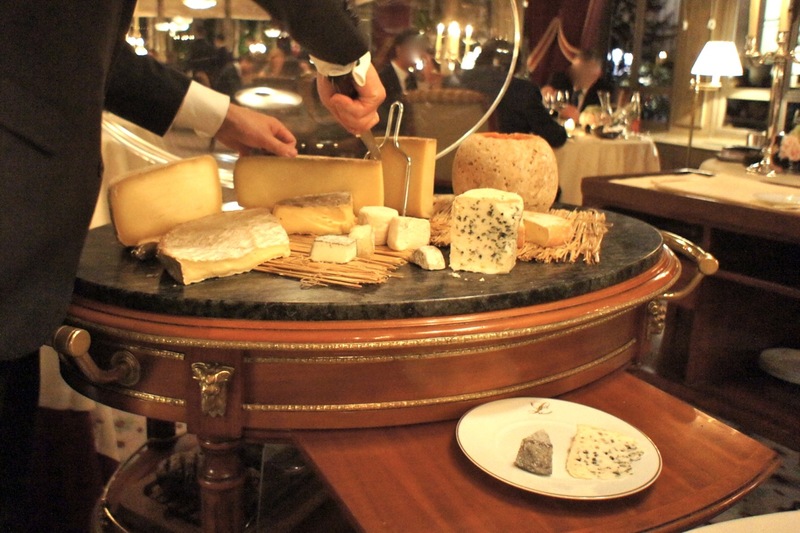 When he was bringing out his cheese trolley (which was a great selection by the way), he was introducing a cheese which we hadn't seen before; the french mimolette (an orange cheese with a hard outer layer and shaped like a ball). We asked him what it tasted like and he disinterestedly replied: "I cannot describe it". Not very helpful, but he did warm up after a while and chatted with us more, telling us the story about the french mimolette and why it's orange (Louis XIV wanted to differentiate it from the Dutch mimolette - "then why colour it the Dutch national colour?" I asked, to which he had no answer). 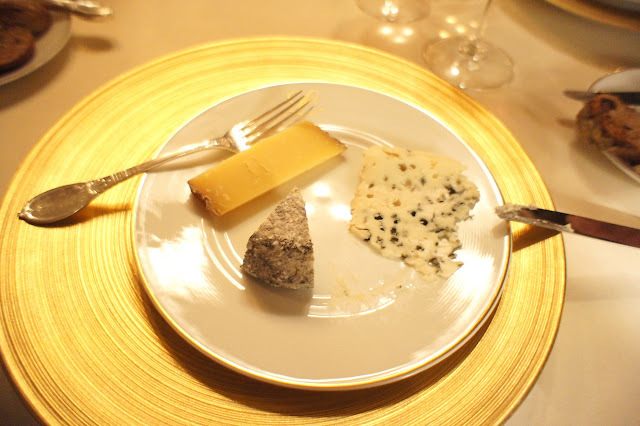 In the end, my wife opted to try the mimolette (which tasted like cheddar - so much for the fuss then) while I had a goat's cheese with ash, a rochefort and a comte. During the dinner, when he was clearing our plates, he accidentally dropped one of our plates, the cutlery clattered on the floor making quite a din. Other than that, service was very good here, and we decided to overlook the quirkiness of our very Parisian waiter. When petit four was served the Sommelier came round with a bottle of Sauternes and asked if we wanted a glass each, "mais oui, bien sur!" we replied in our best kindergarten french. Good choice, as it turned out, as the sweet wine paired well with the fantastic desserts which were to be served. The first dessert was an interesting coconut milk ice cream (with a silver leaf) and with a thin slice of coconut pastry as the base. It was interesting because we did not expect it to have literally no taste; it wasn't sweet, it wasn't milky, if nothing else, it was a bit salty. But it was very good, it was like a palate cleanser to bridge us from the heavy and savoury main courses to the sweet desserts. It was a very thoughtful dessert. 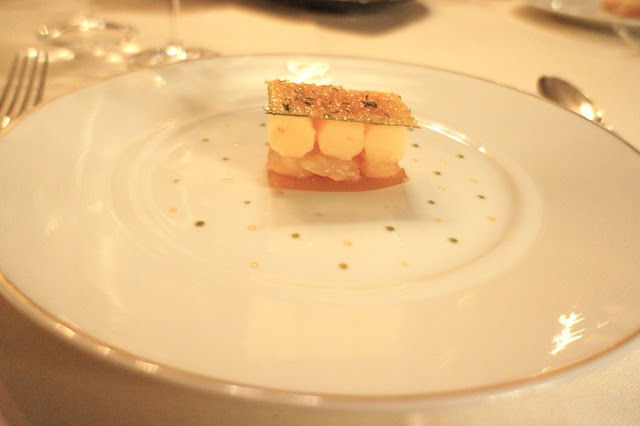 Then came the sour dessert; a millefeuille of grapefruit sorbet and slices of grapefruit. This was a visually stunning and one of my favourite desserts ever. The very sour grapefruit slices matched against the less sour grapefruit sorbet and was balanced off by the sugar layer on top. 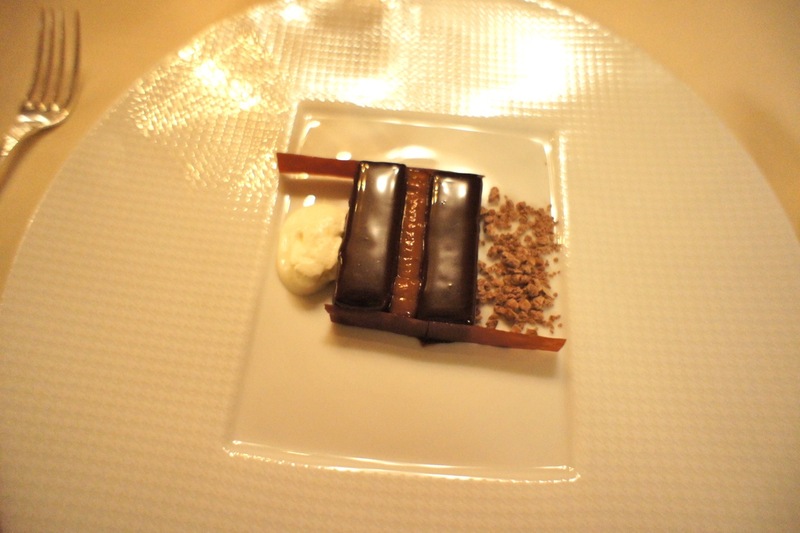 Finally, the Mars bar dessert, which was a rich chocolate and caramel cake with ice cream and chocolate shavings; a fitting end to an almost perfect meal (pity about the service though..). A great restaurant and one to revisit the next time we are in Paris. One of the truly underrated restaurants in Paris and one which we wouldn't have known about if L'Arpege didn't burn down that week. Food: Exquisite. Main courses were classically prepared and desserts were innovative. 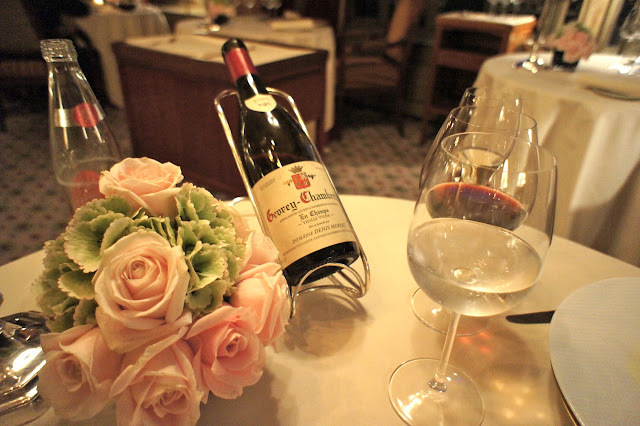 Wines: A very impressive wine list which was reasonably priced relative to its peers in Paris. 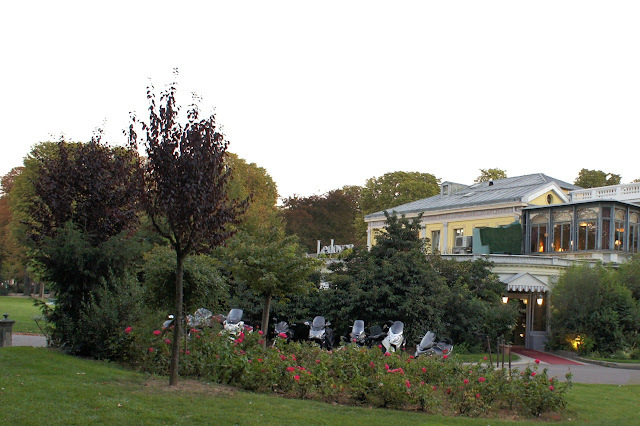 Ambience: Very formal environment, but with lovely views of the grounds (we were seated next to the window). 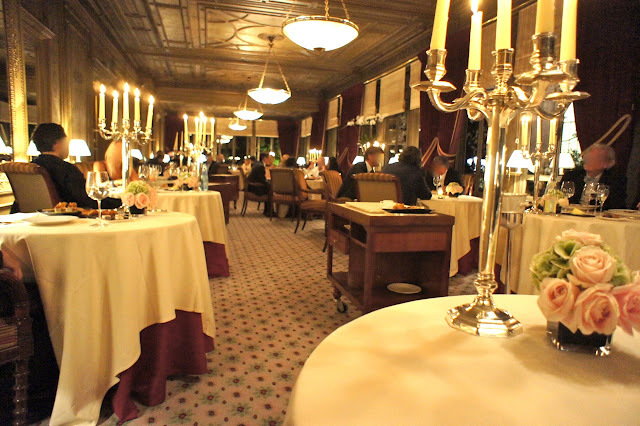 A grand dining experience. You went there on a good day, and I am glad you enjoyed it because my two visits there (one in 2009, the other in 2010) explained why they deserved to be underrated.